We used to do this thing. We were young, full of energy and dreams. We walked through snowstorms, singing carols and laughing, out of breath with happiness and anticipation. It would be snowing in tremendous bands of winter whiteness, and we’d run with our cousins, sliding through the snow. We would be the only ones out as we walked past houses filled with light, the doors shut against the elements while we embraced the falling snow. We used to do this thing. And it is one of my favorite memories from my years on Muddy Brook Road. I want our children to know it on this side of Elizabeth St. It was cold, and blowing in sideways sheets, blustering like a Connecticut winter hurricane. The street lamps illuminated yellow orbs of light on the blanketed road, and we stood under the lights, looking up at a touchable sky. 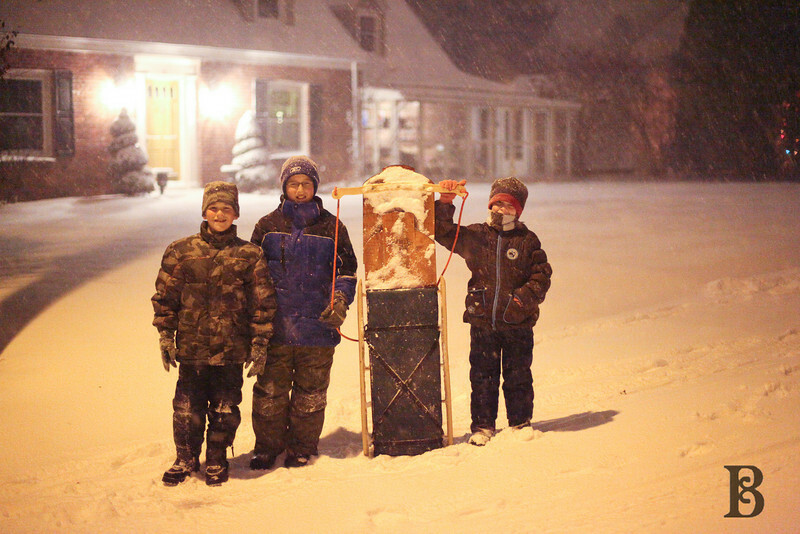 We were full of anticipation, knowing that the falling snow was just the beginning of a much-reported blizzard. We were happy, full of energy. We sang ‘Silent Night’ at the top of our lungs while we walked on Fairview Avenue. We laughed, watching the flashlight illuminate the snow. It was ethereal, and so quiet, as if our voices stopped their resonance as soon as they exited our bodies. The stillness was a memory all its own. Our boots made the first imprints the snow had seen. No cars had gone this way, none passed us on our walk. No snowplows or people. It was just us five against the beautiful, wind-whipping elements. 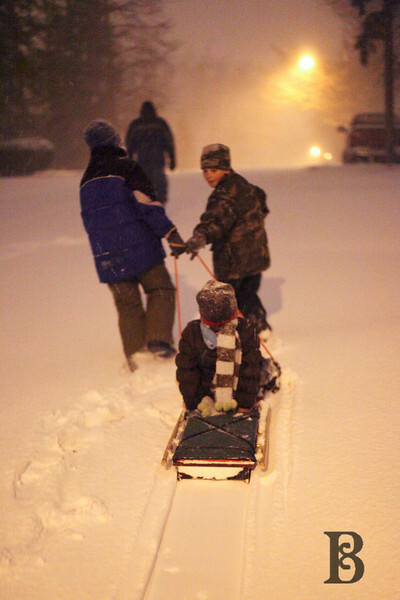 We pulled them on the sled, taking turns as we let them slide down the hill on our little street, Paul at the bottom, and I waiting, standing nervously at the top. I got to see the look on their faces when they leapt to their feet with wide eyes as they reached the bottom. It was worth it. We were the only ones out; walking past beautiful Victorian homes filled with light, their doors shut against the elements while we embraced the falling snow. It was as I remembered. And I walked, hoping that they felt it. Hoping that our children could feel that they were making a memory. 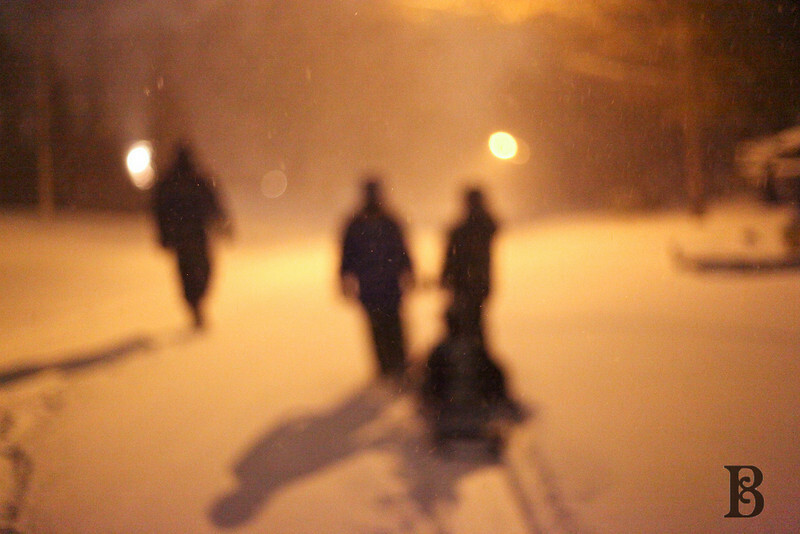 We trudged up Florence Avenue, realizing that pulling a wooden sled in thickly fallen snow against whipping wind is work. So Paul braved the duty, and we hung back together, watching as three soft shapes moved in front of us. It was as I remembered. Maybe better. Or just a little different. But filled with the same awe and appreciation of what we have, what we were doing in that moment. Filled with anticipation and plans, dreaming about what the year can bring, what the future might hold. It was as I remembered. In some ways. On a different street, with different people. Coming home to a different house. Last night in the commencement of the snowstorm, I realized it. With all the goals I have, the dreams I dream, the inner hopes that haven’t been voiced to anyone else- even with all of that, this is it. Here is where it is. These small moments of memory. Even with all of it, what I really hope to someday know is that they are happy, -even with all of my mistakes- to know that they are well-adjusted throughout their life, to know that they are at peace; that will be one of my greatest joys. With all I could ever hope to accomplish, in the end, it will be these four people in my life who were the best part of it all. Cheryl - Just one question: When you write these posts, do you think, hmmm, how can I make my Mom cry? Mary - Beautiful. Touching. Inspiring. Thank you. Mckenzie Jean - I stumbled up on your blog, and this is darling. I noticed you mentioned Connecticut..I’m assuming you live there? I was born and grew up there for a bit of my life! I adore it, and really wouldn’t mind ending up there again at some point in my life! Bethany - Im loving the memories Im having now while my boys are still so small but when you put up a post like this….I just cant wait for these moments!